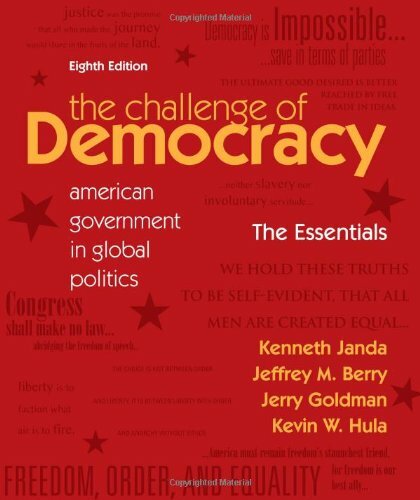 [PDF] The Challenge of Democracy: American Government in Global Politics, 8th Edition | Free eBooks Download - EBOOKEE! Description: This best-selling American government text is highly acclaimed for the non-ideological framework it uses to explore three themes: freedom, order, and equality as political values majoritarianism versus pluralism debate and globalization's effect on American politics. Extensively updated, this edition includes new examples, figures, data, and current discussions. The authors include balanced coverage of the first two years of the Obama administration, coverage and analysis of the 2010 mid-term election, and a retrospective of the Bush presidency. THE ESSENTIALS version of the text replaces both the Seventh Edition of the Brief version and the Second Edition of the Student Choice version. The Eighth Edition can be packaged with Aplia, which offers students automatically graded homework assignments. Organized by chapter, Aplia helps provide students immediate, detailed explanations, and helps them come to class better prepared for discussion. For more on Aplia and other media available with this text, click on Supplements. No comments for "[PDF] The Challenge of Democracy: American Government in Global Politics, 8th Edition".